The “POE RUN” LED which indicates PoE power input, is powered by the incoming 48-57V PoE voltage running through a high power resistor. It’s not really ideal, but i think this might also help with loading on the PD side to cope with the minimum power draw. The 24V/12V LED indicator is also hard-wired, rather than using some fancy comparator circuitry which increases cost. Someone at the factory had to hand-solder either the front panel LED indicator and/or the correct resistor because there’s some flux residue in that area on an otherwise clean board. The front panel LEDs are also overly bright. If you wish to place this unit somewhere in your living space, you might want to consider covering the LEDs with duct tape or something. You can see more photos on the Flickr album here. The designers helpfully included a handy table of resistor values (R7 & R8) for different PD identification signatures. In this case, it identifies as a 90W LTPoE++1 PD. 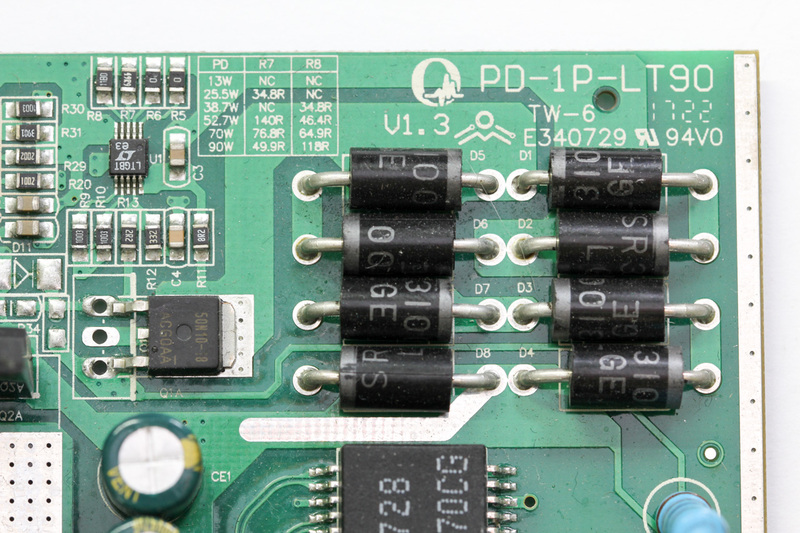 The signature output pin (T2P) should have been used to interface with the output regulator for current limiting, in the case where the PSE can only supply lower currents like 13W or 25.5W. This implementation just assumes that the PSE will always be able to provide the high current, or none at all. Drawing too much current will likely cause the PSE to cut power, killing the entire unit and having to restart the PD negotiation again. Sure this works, but It’s just not a good design (if there was any “design” at all). The unused open-drain outputs are just being pulled-up to Vcc with a 100K resistor. There are various places on the board where the solder mask have been stripped. These allow for solder to be added to the traces to increase current carrying capacity. 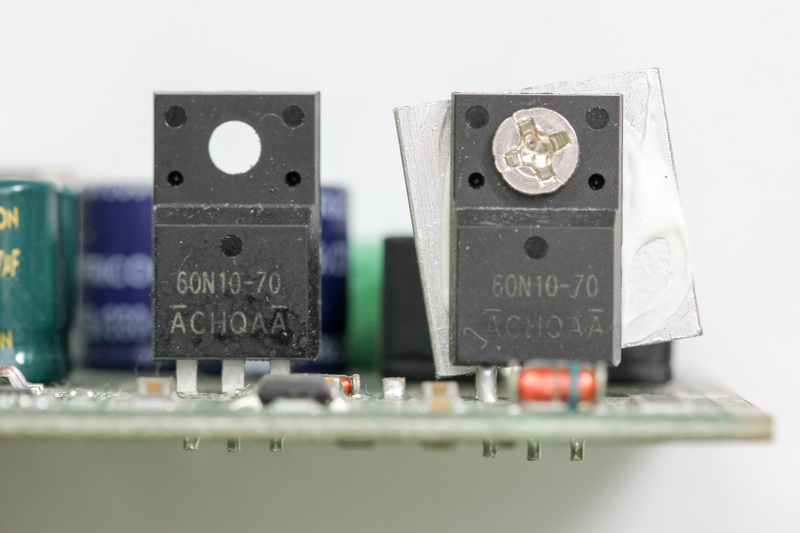 The NCP1034 uses two N-channel MOSFETs, so in this design both have been chosen to be the same — 60N10 — one of those “jellybean parts”, it seems. 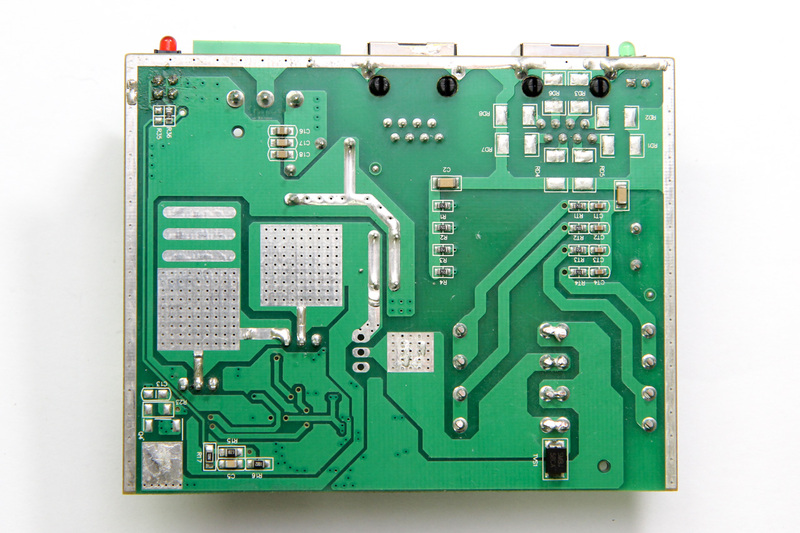 The large PCB pads for heat dissipation are not really used. Instead, the high-side MOSFET is just free-standing (“flapping around in the breeze”), and the low-side MOSFET has its own free-standing heatsink. As the case is fully enclosed, there is no airflow within the case, so the heat won’t be efficiently dissipated. They should have designed the MOSFETs to be thermally coupled onto the case for better heat dissipation. According to ONV’s product datasheet, it quotes an MTBF of 190,000 hours (about 21 years). The output voltage of the regulator is controlled by resistor divider R15 & R16, located on the back side of the board. This model uses 182K and 10K, which gives exactly 24V, when coupled with the internal reference of 1.25V. There is also a 12V output variant of this PoE splitter, which presumably uses different resistor values for the divider. The NCP1034 has a SS/SD (soft start / shutdown) pin, but that’s just tied to a capacitor to provide for soft-start. 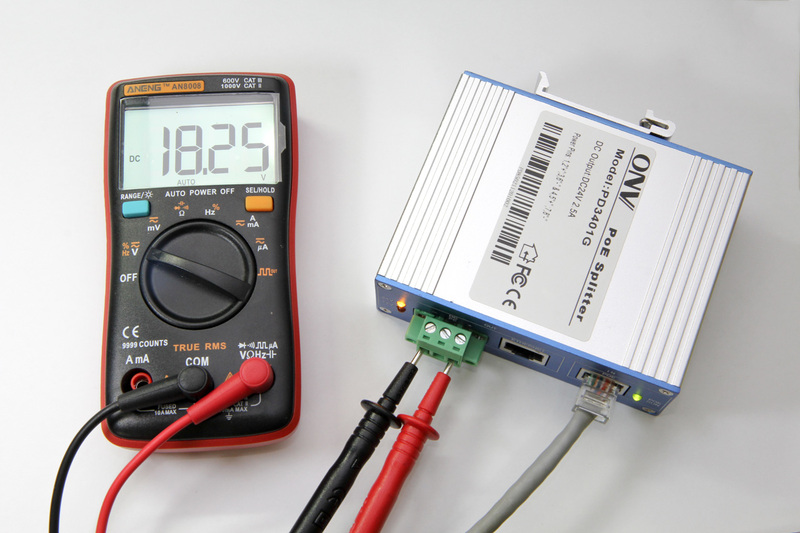 The NCP1034 does have a few UVLO circuits that prevent the MOSFETs from operating outside some predetermined conditions, so they are just relying on that. Everything else is pretty textbook. As I have mentioned in my PoE Quick Guide, trying to get PoE splitters in non-standard output voltages is quite difficult (and that translates to being expensive). 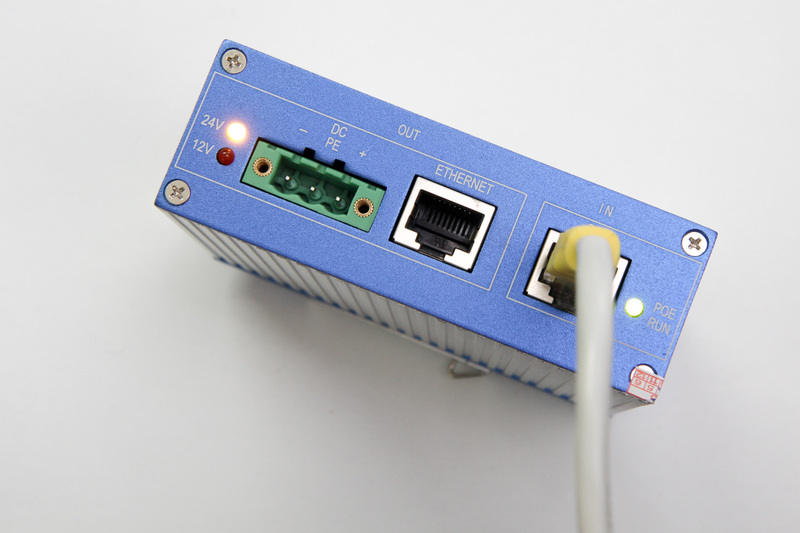 Since this splitter is based on the NCP1034, we can adjust the output voltage ourselves with help from the datasheet. The output voltage is given by Vref * (1 + R1/R2), so if you use the current resistor values R1=182K and R2=10K, we get 24V exactly, less tolerances. To change the output voltage, we need to adjust the values of these resistors accordingly. However, this resistive divider ties in with the compensation circuit. The compensation circuit used here is of the “Type III (PID)” kind. Their values are dependent on R15 (R1 in the datasheet) because they are placed in parallel. If you wish to alter the output voltage, it is therefore recommended to change only R16 (referred to as R2) because compensation only depends on R1. Due to these constraints, you might not get the accurate output voltage you want, but at least you won’t have to re-calculate the compensation network values. The closest valued resistor I could buy is either a 13.3 or 13.7K; with these, you either get ~17.85V or ~18.35V. To get closer to 18V, I decided to get use 13.5K, which could be achieved by stacking two 27K resistors in parallel, yielding an output of ~18.102V. Using a small DC load tester, the output voltage seems to be maintained when approaching a 2W current draw, although I don’t know about the ripple. I don’t have any proper equipment to test higher currents for a sustained period, but I will report back if there are any developments on this unit. The splitter caused no problems with the Gigabit speed, so I assume it’s properly designed — the traces are of matched length, and the transformer parameters were correctly chosen. The unit is compact, relatively low-cost and works as expected. 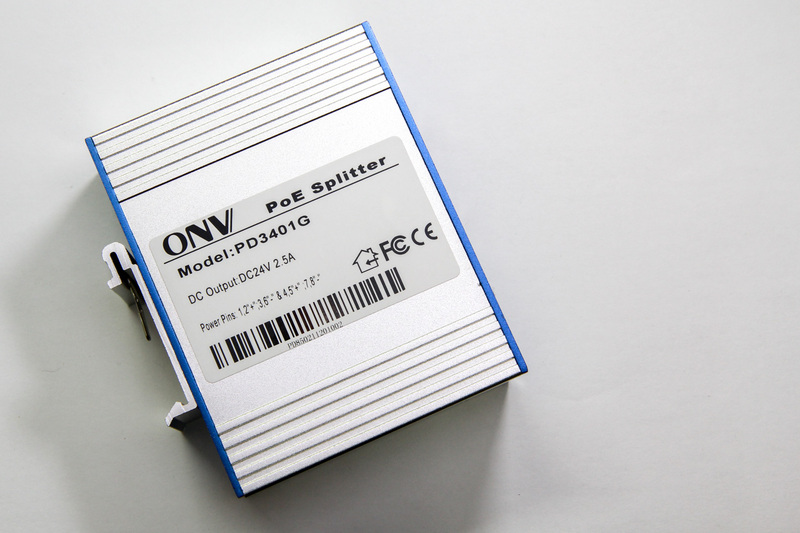 As an added bonus, you now have the means to modify the output voltage of this splitter easily. Blindingly bright LED indicators. I am clearly not the only one who has an issue with this, @marcan42 recently talked about the appropriate brightness levels for LED indicators as well. Non-isolated supply. Technically PoE splitters should use an isolated DC-DC regulator, since the Ethernet data signals themselves are already isolated. However, if you are connecting to wireless equipment or other equipment that will not connect to more devices physically (electrically), then that should be fine. Possible over-current of PSE supply. 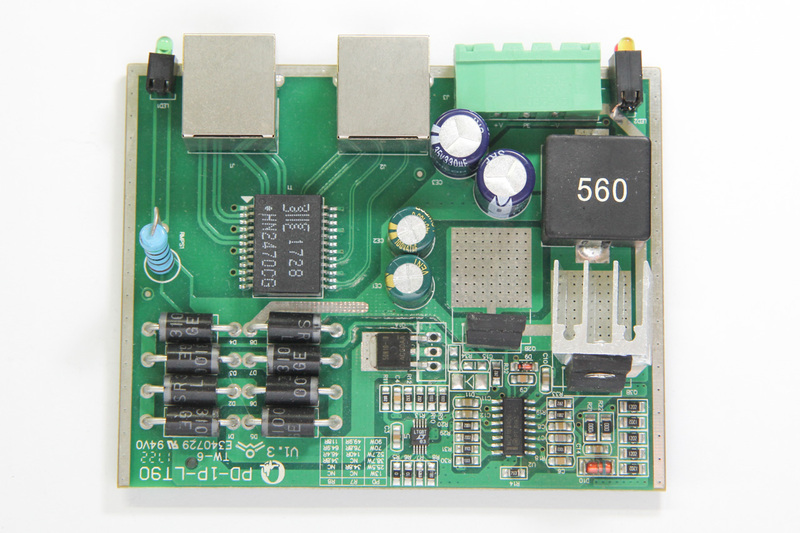 Because the power supply section is functionally isolated from the PD controller, it may try to supply more current to the downstream device than the PSE can provide. There should already be current-limiting on the PSE supply, which shouldn’t be a big problem but still, this non-compliant PD behaviour can and should be fixed. Shorter-than-ideal lifespan. Heat always shortens the lifespan of electronics. This device could theoretically last much longer if the MOSFETs had their bodies somehow affixed to the exterior aluminium case for heatsinking. Having the MOSFETs just free-standing inside a closed aluminium case with no airflow just doesn’t help to cool it. If you did find this review useful or have any questions, please feel free to leave a comment below. This entry was posted in electronics, sysadmin and tagged PoE.